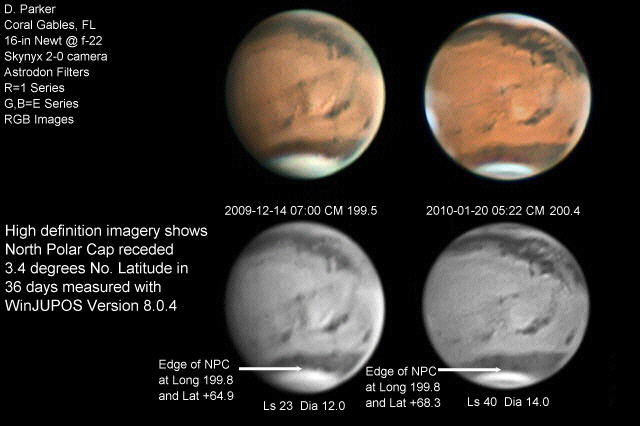 Tharsis Volcanoes Well Recorded by Mars Observers in early March 2010. 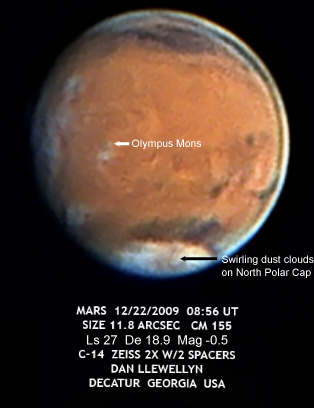 Elysium Mons Region Well Recorded by Mars Observers in February 2010. 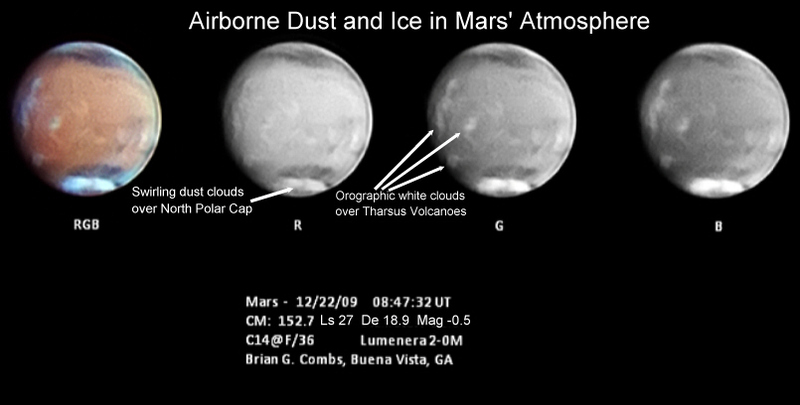 Observers should be on the lookout for dust clouds originating over the North Polar Cap. 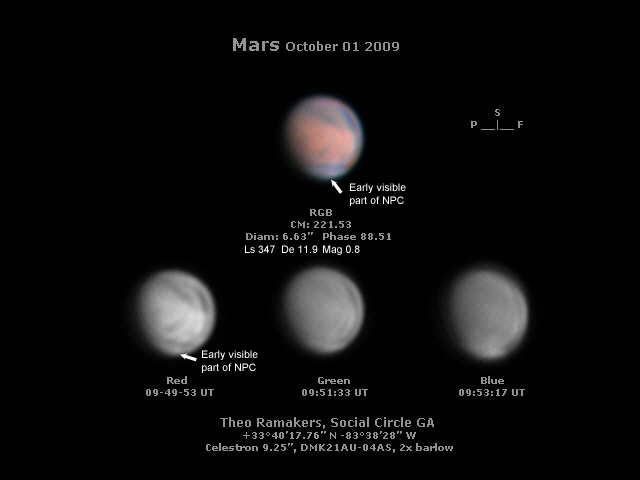 The above images show a curving dark streak across the North Polar Cap. 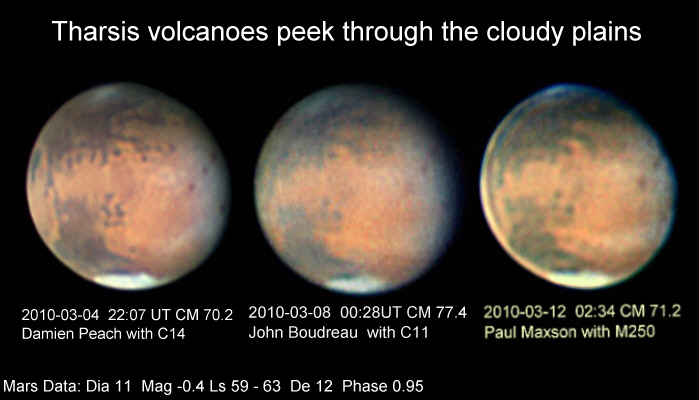 The interpretation of this phenomenon is for airborne dust clouds driven by very high velocity winds. 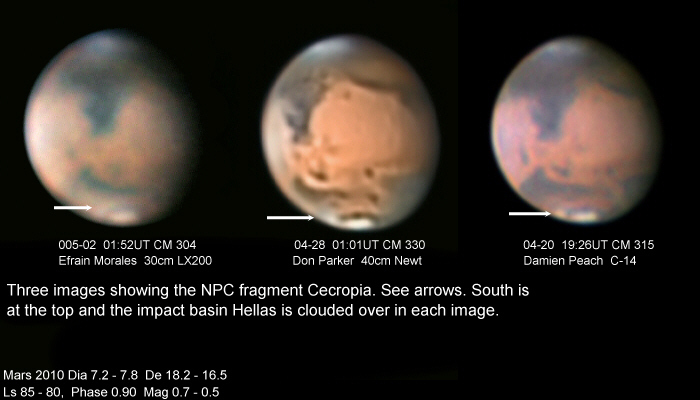 This kind of activity may be a likely explanation of the Dec. 4th images of the NPC below. 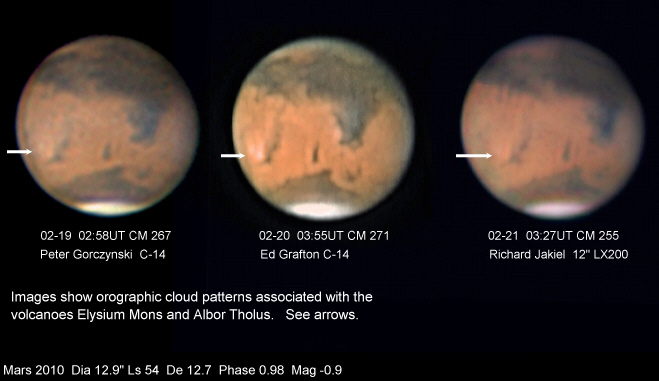 Another interesting observation is that the H2O ice clouds over Tharsis are so dense they are readily visible in the red-filtered image! 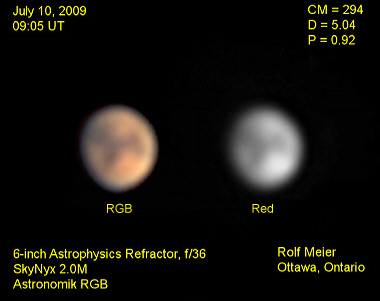 John Boudreau’s excellent RGB images show a dark feature splitting the NPC that is really a mystery to ALPO. 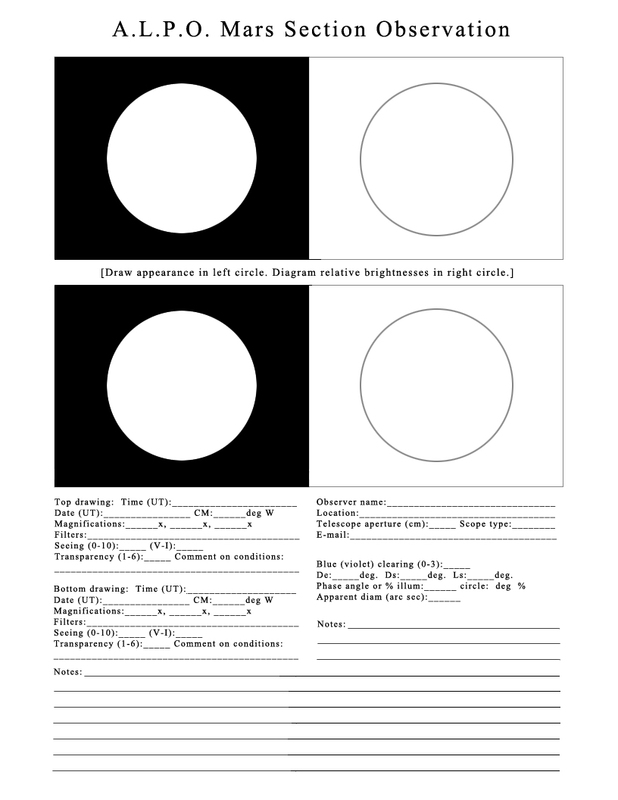 The validity of the dark marking is demonstrated in an animation John made showing it to rotate in time. 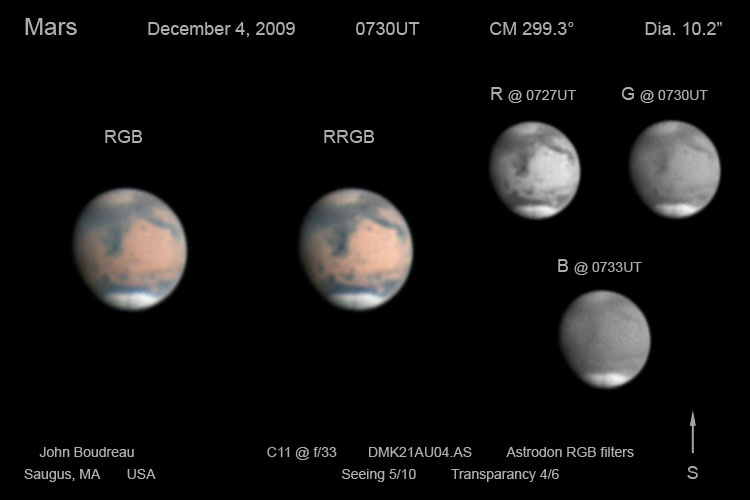 Repeatability of image quality from apparition to apparition allows ALPO members to discern changing features on Mars. 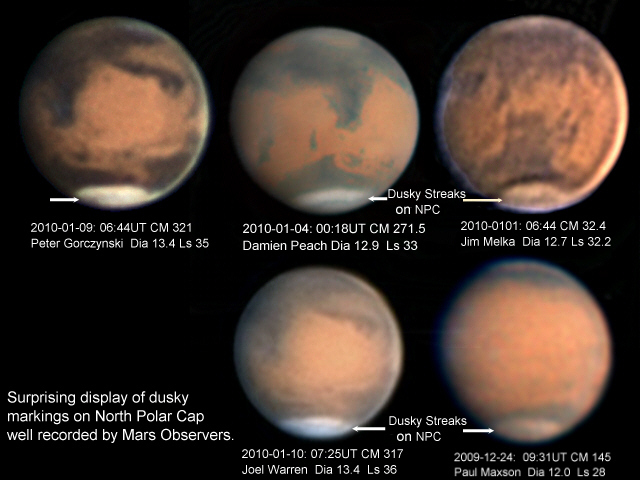 The above two image sets recorded by Ed Grafton show among other things that the Western half of Solis Lacus is still covered with bright material as it was after the planet-wide dust storms of 2007. 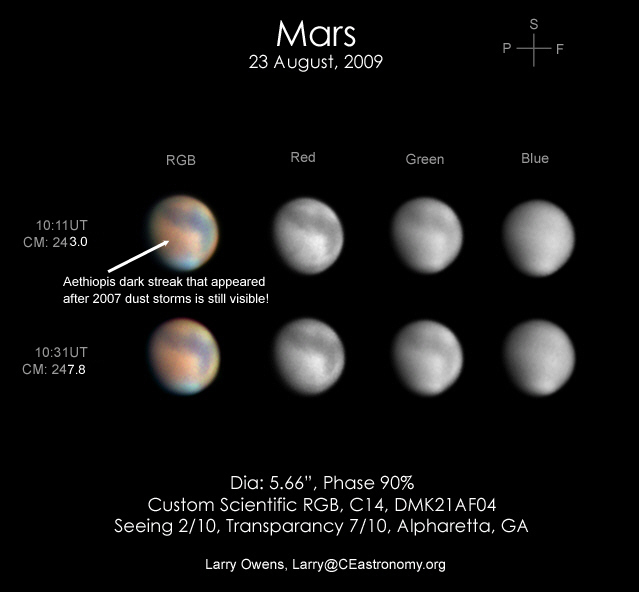 The dark Sirenum extension that appeared after the 2007 storms, persists in this apparition. 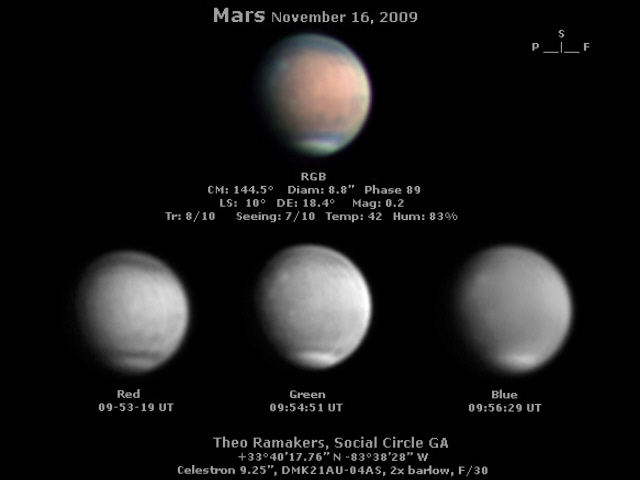 The dark linear marking connecting Solis Lacus and Phoenicis Lacus has faded considerably in 2009. 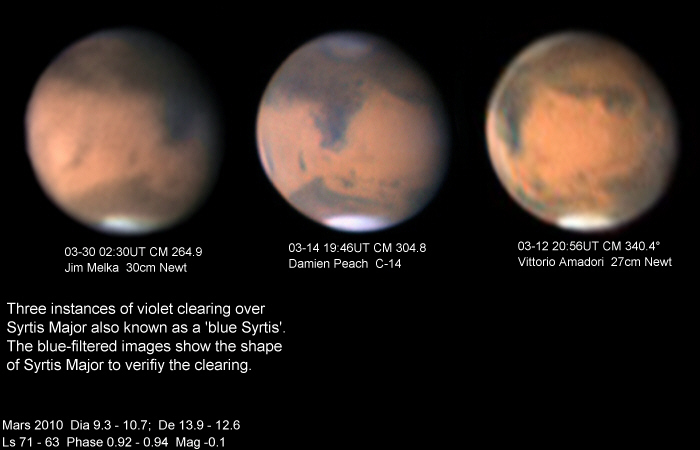 If you are interested try using ALPO Mars maps to find Tharsis volcanoes in the images. 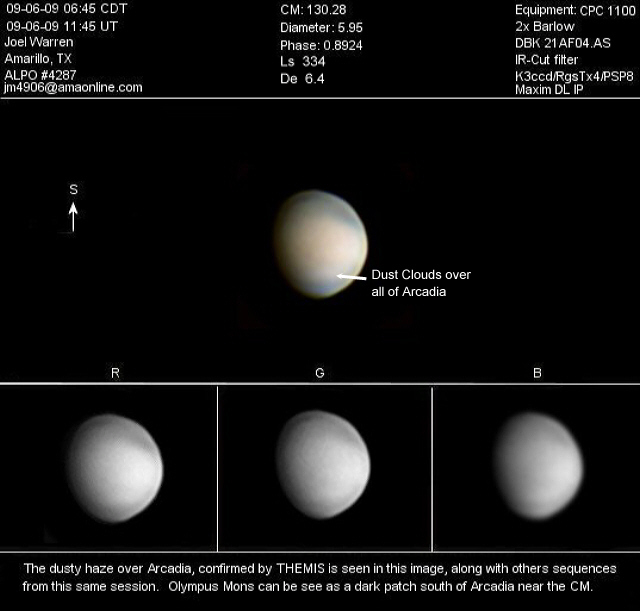 Good hunting. 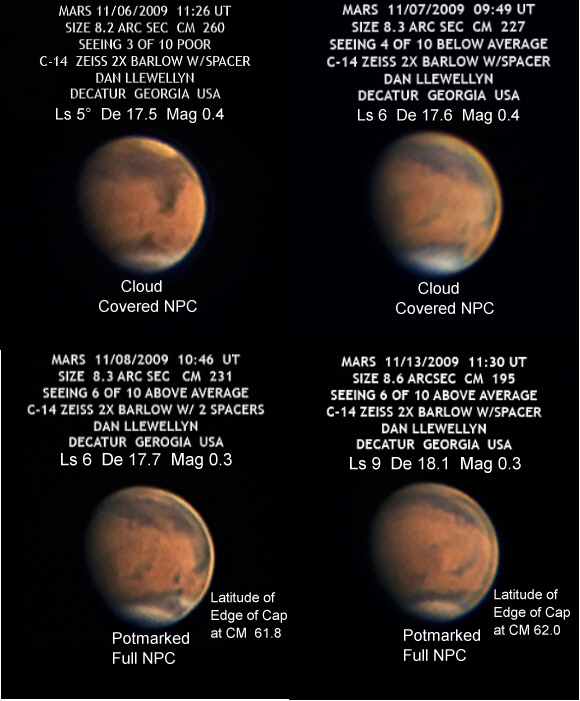 High resolution bayer color images show the North Polar Hood clouds on Nov. 6 and 7 in row 1. 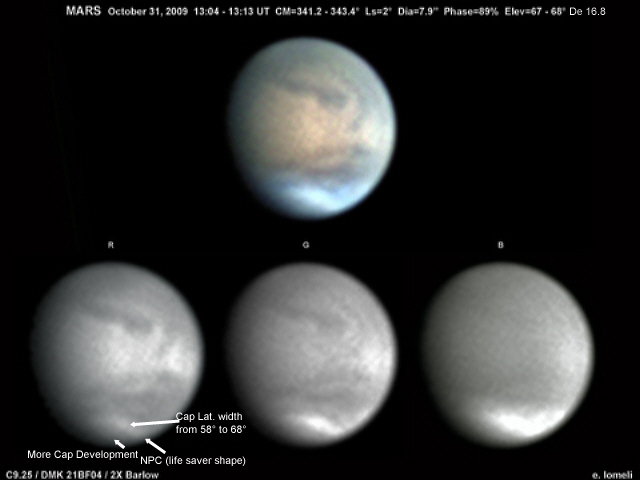 The clouds are not visible in the Nov. 8 and 13 images in row 2, and instead show the North Polar Cap. 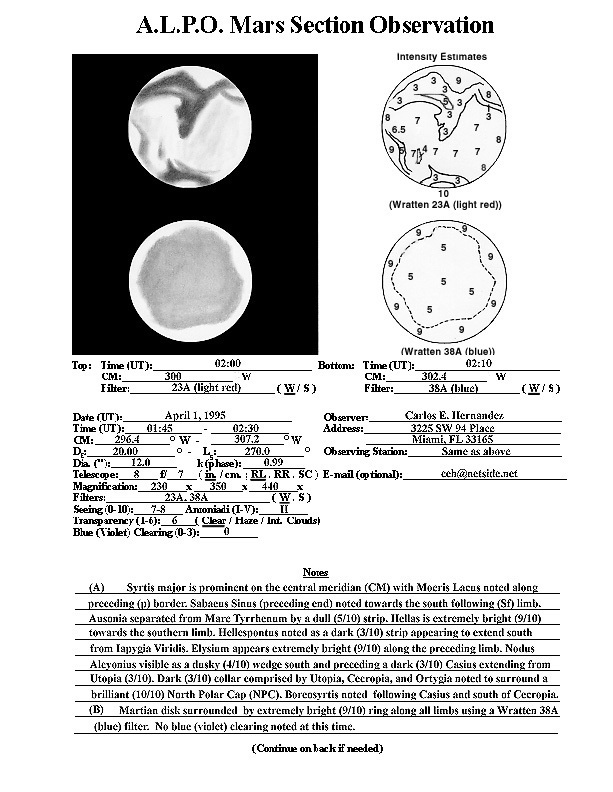 Extinction at the high slant angles near the Pole may contribute to the contrast of the dark spots on the cap. 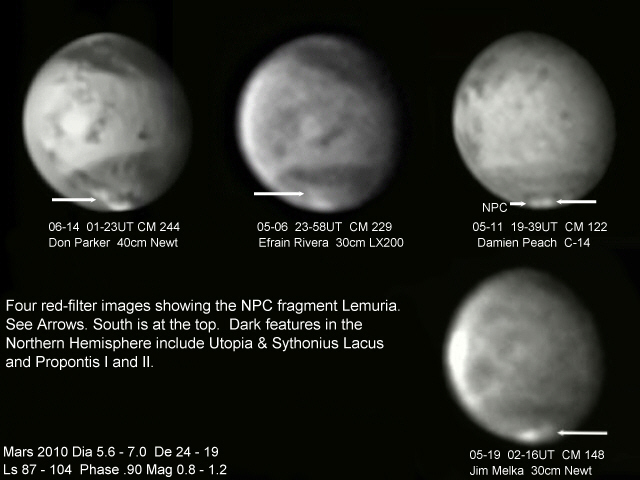 Ed Lomeli’s red image shows development of the NPC with the lifesaver pattern and possibly the start of brightening of the rest of the cap in a broad band over Cecropia and Ortygia. 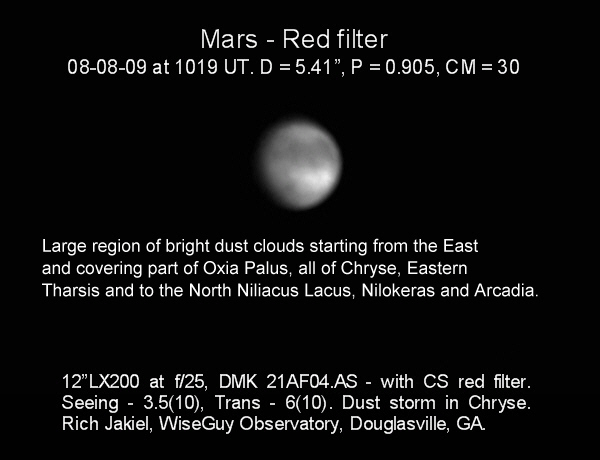 Rolf Meier’s image shows a dust cloud in Northwestern Hellas and over Mare Ionium and Serpentis. 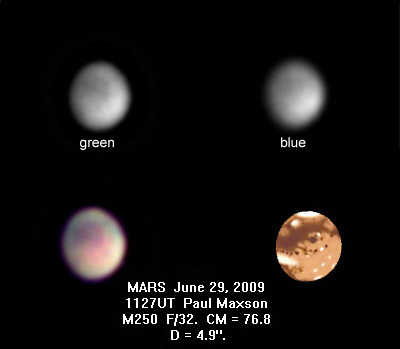 Paul Maxson’s image shows a dense cloud over Margaritifer Sinus on the evening (left) limb. 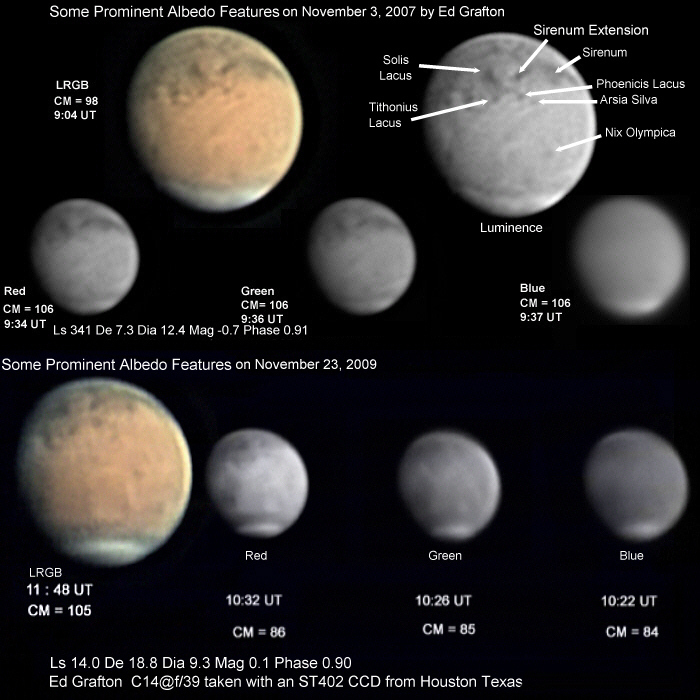 Both images have a broad pole to pole haze over the Morning limb.